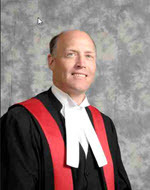 Associate Chief Judge Wishart obtained a Masters of Science degree from Queen’s University in 1990, followed by a law degree from the University of Victoria in 1994. She was called to the BC Bar in 1995 and began her legal career with a Victoria law firm. She then worked as a contractor for various Ministries of the Provincial Government and as a Clinical Instructor in the University of Victoria Law School. In 1998 she returned to private practice, mainly in the area of criminal law, and conducted cases at all court levels. During her time as a lawyer Associate Chief Judge Wishart was active in the Canadian Bar Association. She chaired the Victoria criminal law sub-section, was an elected member of Provincial Council, and an elected member of the Executive of the CBA - BC Branch. Judge Wishart was appointed to the Provincial Court of British Columbia in March of 2009, serving Victoria, Duncan and the Western Communities, where her duties have included sitting in two of the Court’s specialized courts - the Victoria Integrated Court and the Cowichan Valley Domestic Violence Court. In November of 2014 she was elected president of the Provincial Court Judges’ Association and in that capacity served as a member of Judicial Council for the year 2015. In May of 2016 Judge Wishart was appointed Associate Chief Judge and appointed to Judicial Council commencing in July of 2016. As Associate Chief Judge, she serves on various committees including access to justice initiatives, court technology, and business intelligence. She has participated in changes to the Small Claims Rules and the Court’s planning to accommodate the implementation of the Civil Resolution Tribunal in 2017. She is also involved with the specialized courts across the province including Indigenous Courts, Downtown Community Court and Drug Treatment Court in Vancouver, and Victoria Integrated Court. Associate Chief Judge Dohm graduated from the University of British Columbia with a law degree in 1989 and was called to the Bar in 1990. From May 1991 to May 1992 he held the position of legal counsel to the Commissioner of Industrial Relations Council. He then spent a year in private practice before joining Crown Counsel in October of 1993. Associate Chief Judge Dohm served as Crown Counsel in Vancouver and Administrative Crown Counsel in Nelson before returning to the Lower Mainland and working as a major crime prosecutor. He was appointed to the Provincial Court in December 2005, and has sat primarily in Surrey, Abbotsford and Chilliwack since then. Appointed Associate Chief Judge in November of 2018, Associate Chief Judge Dohm has administrative responsibilities in the areas of scheduling, regional operations, complaints, criminal law reform, the Judicial Justice Division and the Justice Centre.